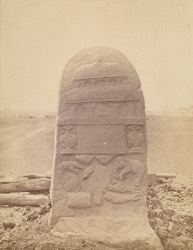 Photograph of an inscribed and sculptured stone at Mantur, taken by Henry Cousens in the 1880s. In the report he wrote at that time he said, "Near the village of Mantur, about six miles to the east of Hubli Junction, is a very curious stone. The upper portion of the face of the stone has a representation of a three-storeyed Dravidian temple or gopura, on each storey of which are portions of an old Kanarese inscription in letters of the tenth century A.D. The uppermost line tells us that the stone-cutter, Kante, fashioned this stone...Beneath all this is a group of symbols...In the centre is a hand mirror and around it are two conch shells, an elephant, two fishes, a drum, a wheel and a boar...The mirror may possibly be the crest of a paramount sovereign surrounded by those neighbouring kings whom he had conquered. The boar was the crest of the Chalukya, the elephant that of the Cheras or Ganga Kings of Maisur and the two fishes that of the Pandyas."